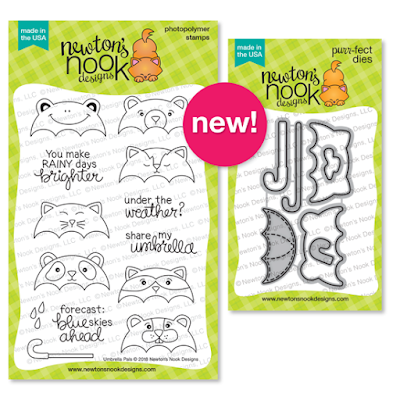 Hollybeary Creations : Newton's Nook April Release Day 3!! Newton's Nook April Release Day 3!! It's day three of the April Release from Newton's Nook Designs and today we are introducing Umbrella Pals and it's coordinating dies. This is a Fun set full of fun umbrella characters sure to make anyone smile!! It created a background on some Distress Watercolor Paper with some Salty Ocean Distress ink and then I stamped the raindrops from the Umbrella Pals set using the same Salty Ocean Ink. I set the panel aside to dry. I stamped all the umbrellas onto some X-Press It blending cardstock and colored them in with Copics. Then I used the coordinating dies to cut them out and I adhered them to the card front with some foam adhesive. I die cut a banner from the Frames and Flags Die set and stamped the sentiment and trimmed it to fit along the edge of the card. This is such a Fun set!!! Comment on the NND blog and Design Team blogs (see list below)! The winner will be chosen at random from the collective reveal posts. Make sure to check out each of their blogs and comment for your chance to win. You will not know which blog has been chosen so the more you comment on the better your chances are of winning! You have until Thursday, April 19th at 9pm EST to comment -- winners will be announced on the blog post on Friday, April 20th. 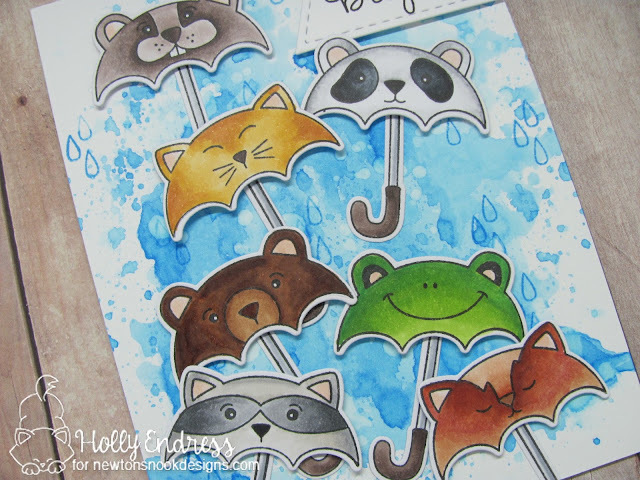 Those critter umbrellas are adorable and I love the splashy background! Beautiful card and this set Umbrella Pals stamp set and Umbrella Pals coordinating dies are a must have. Love these umbrella stamps and your card! Your background is just perfect as rain. NICE JOB!!!!!! Fabulous card! I love the raindrop background! Great way to use all of these adorable characters, Holly. Darling card! I love the rainy background. The background really speaks wet and rain. Love the card. So fun. These umbrellas are precious! I love the many types of critters you made. I love this set; even a plain stitched umbrella can be made. Think of the colors, but then you did in all those colored animals! 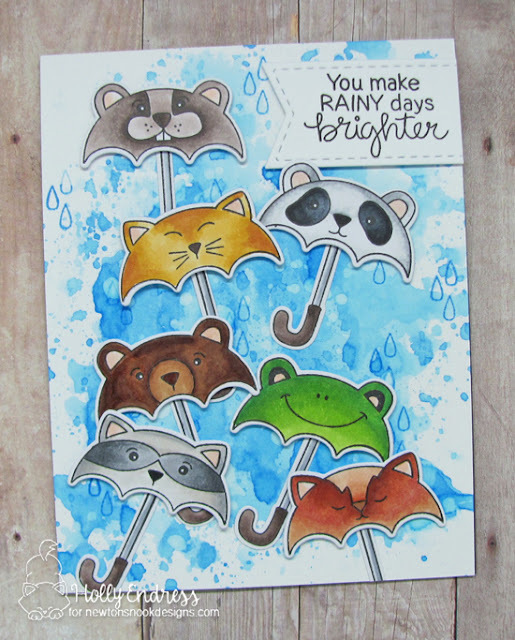 Super cute card - love the raindrops background and the adorable umbrella critters. Love the effect the oxide ink has in your rainy background! These are the cutest umbrellas!! I want a set of 'em in real life! I love the splishy-splashy background to go with those adorable umbrellas. Thanks for sharing such a cute card! Wow! Stunning background!!! Adorable card!!! What a sweet background for those adorable umbrellas. Awesome background!! It perfectly compliments all of the umbrellas! I love how all the umbrellas are crowded together in front of the rainy background! Awesome card! I love these umbrella stamps so super cute and I love your card!!! Look great background to go with these fun umbrellas! Awwww, such an adorable card! I love you design!